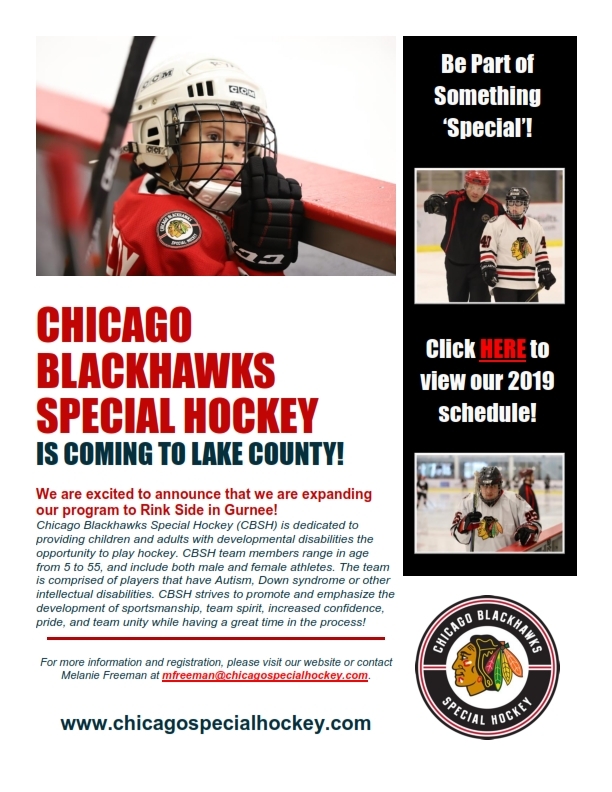 Chicago, Ill., December 6, 2018 – Chicago Blackhawks Special Hockey (CBSH) is excited to announce that they will be expanding their program to serve the Lake County area. CBSH will skate out of Rink Side Sports located at 6152 West Grand Avenue in Gurnee, Illinois. The Lake County program will run January 6 through March 24, 2019. Please click here for a detailed schedule. Registration is now open, and application forms can be found on our website at www.chicagospecialhockey.com. Questions can be directed to Melanie Freeman at mfreeman@chicagospecialhockey.com. Chicago Blackhawks Special Hockey (CBSH) is dedicated to providing children and adults with developmental disabilities the opportunity to play hockey. CBSH team members range in age from 5 to 55, and include both male and female athletes. The team is comprised of players that have Autism, Down syndrome or other intellectual disabilities. CBSH strive to promote and emphasize the development of sportsmanship, team spirit, increased confidence, pride, and team unity while having a great time in the process.